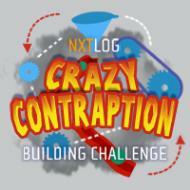 NXT Geek: Crazy Contraption Building Challenge!!!! Many robots are designed to do simple tasks in an efficient way to make our lives easier. But what if robotic machines did simple tasks in an over-complicated way? That’s what we’re asking you to explore in this NXT building challenge. We want you to design a LEGO MINDSTORMS NXT Crazy Contraption to perform a simple job like turning a page or clicking a LEGO brick, but in the most creatively complicated way you can imagine. Yes we’re inspired by the work of Rube Goldberg for this one! There's no limit on amount of LEGO MINDSTORMS NXT sensors, motors, NXT programmable bricks, HiTechnic sensors, or Bluetooth communication you can use on your Crazy Contraption robot. All entries must be tagged "crazycontraption." Entries must be submitted by March 31, 2012. What will you make? Robots will be judged in five categories: FAN FAVORITE AWARD: This award is based on the ratings from the NXTLOG Community. The highest rated robot(s) in the challenge will be eligible for this award. Please vote only for your favorite and be a fair voter as well. JUDGES AWARD: This award will go to a creative project the judges feel deserve special merit. BEST TECHNICAL PRESENTATION: We will be looking for NXTLOGs that best document how the Crazy Contraption robot was designed, programmed, and functions in a clear, concise, and creative way. How well can you show and explain your robot's over-complicated technical capabilities? MOST CREATIVE PRESENTATION: How are you using NXTLOG creatively to document your project? ARTFUL DESIGN: Is your Crazy Contraption amazing to watch? There are many NXTLOGgers that take great pride in designing their robots with care, and we want to encourage and recognize this kind of great work! All entries to NXTLOG fall under the Terms of Service: http://mindstorms.lego.com/nxtlog/Terms.aspx. Entries must be submitted by March 31, 2012. All entries must be tagged "crazycontraption.” Only LEGO elements may be used. There's no limit on amount of LEGO MINDSTORMS NXT sensors, LEGO MINDSTORMS RCX sensors, motors, NXT programmable bricks, HiTechnic sensors, Codatex RFID sensors, or Bluetooth communication you can use. A programmable LEGO MINDSTORMS NXT brick must control the robot's actions. You may enter more than one robot. You may enter a robot that was previously submitted to NXTLOG (just remember to add the tag, crazycontraption). All documentation must be posted on NXTLOG. You must include the following in your NXTLOG Building Challenge entry: • Description - Careful, well-written explanation of how the robot was designed. • Pictures of the robot - Clear, well lit pictures - (no blurry ones!) • .rbt Program(s) - Annotations within the programs are a plus! • (Optional) LEGO Digital Designer File (LDD) - you cannot submit an LDD file only. Your LDD file must document some or all of your robotic entry. • (Optional) Video - Videos cannot be larger than 4MB and they cannot exceed 2 minutes in length. The allowable video formats are: .mov, .avi, .mpg, .wmv Please only upload only one video per project. Videos cannot contain music. You CAN include the noises that your robot makes. Videos cannot contain people in them Videos cannot contain speech. The contest will be judged by the NXTLOG moderating team. Good luck and play well! I will probably enter after I finish programming my MOC.